In 2009, Foscarini signed a partnership agreement with Diesel as part of the "Home Collection" home furnishings and lifestyle project. 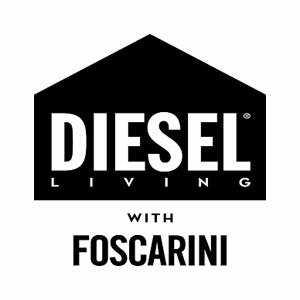 This partnership gives Foscarini the opportunity to liaise with a new target and explore new lifestyles and furnishing trends, through a collection conceived by Diesel for its own target:, "Diesel Living with Foscarini". The Diesel with Foscarini collection speaks a variety of different languages - from rock to pop, industrial design and vintage, from graphics to art - to illustrate the unmistakable Diesel lifestyle. Ironic, transgressive, eclectic, incandescent, the collection includes over 40 different lamp models. The collection is conveyed in various forms, materials and intended uses, it lends itself to distinguish unexpected and unconventional settings, from domestic settings to public environments, always with a strong personality. The selection of, and research into materials for Foscarini, and perhaps even more so in the Diesel with Foscarini collection, is of the utmost importance. Materials which have never before been used in the lighting industry become the added value of the lamps in this collection.